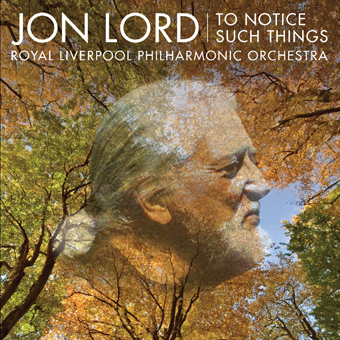 Read the story behind Jon Lord’s upcoming new album, To Notice Such Things, out on March 29, 2010. This is part 1 of a brand new interview for JonLord.org where Jon Lord discusses the music on the new album, takes stock of a busy 2009 and looks at plans for the future. We catch Jon Lord as he is checking the final mixes of the new album. – I’ve now received the final mixes and edits which I’m just listening to at the moment to see if there’s anything else I can complain about, he laughs. Getting serious he explains the origins of To Notice Such Things. – The inspiration for the suite is my friend John Mortimer, who died earlier this year. – He was a great friend and a great inspiration to me and I hope my love and respect for him comes out in the music, says Jon. – A few weeks after he passed away, I was offered a commission to write a piece for solo flute and strings – a flute concerto in essence. At first I turned it down because I thought there wasn’t enough time, but after a couple of days of thought, I realized that I had these three little pieces for flute and piano that I had written for the theater shows that I used to do with Sir John, and I thought that they might provide the basis for this ‘flute concerto’ and that I could write in his memory. – John and I became friends about 12 years ago. A couple of years later he asked if I would be interested in playing the piano and writing a bit of music for him, for his theater shows – “Mortimer’s Miscellany” – during which he sat on the stage and, accompanied by two actresses, a pianist and a flute player, he read poetry and prose, told stories and jokes and related hilarious legal anecdotes, giving his wonderfully wise and witty take on life, love and the law. To Notice Such Things was premiered in its entirety at 2009’s Shipley Festival on July 5 (our reporter said it was ‘a real treat’). On November 17, Jon Lord performed three of the pieces at Sir John Mortimer’s memorial service in Southwark Cathedral, London. The service also included an address from Lord Kinnock, and readings from Sir John Mortimer’s own works. – It was kind of a happy sad occasion. The Cathedral was absolutely packed. There were hundreds of people there, and the list of the guests that they published in The Times the next day was amazing… Lords, Ladies, and Gentlemen as well as us common folk! Lots of famous actors and actresses; politicians, lawyers most of whom had been friends of John and so on. It was quite an occasion. – At the beginning of the service I played the opening piece, As I Walked Out One Evening. Towards the end of the service Jeremy Irons read the poem Afterwards and we played the last movement after that. Then after the service before people left we played Turville Heath. – What pleased me most was that the music that I’d written for John seemed to touch everybody and it seemed to carry his character across to them as well. I was very pleased with that, very pleased indeed. But now we’ll see what the rest of the world think of it. Read also: Jon Lord explains To Notice Such Things, track-by-track. Come back to JonLord.org to read the next parts of this interview – about Jon Lord’s busy schedule in 2009 and future plans. I am ready for more great new music from Jon Lord. WIll pre-order if possible..
Hi Jon. Don’t forget about the good people of America when the touring starts for this CD. As always it’s so nice to read about Jon and read his always positive look at life. When possible I will for sure get his new work. For 2010 I hope at long last will get back to Denmark. It has FAR to long now. If he one get time to play with Blackmore, Hughes and some of the others, I will NOT complain at all. Have been a fan (and you inspired me as a keyboard player) since early Deep Purple, but never managed to see you live. Given your work with the Liverpool Philharmonic Orchestra, when are we going to see you in Liverpool? I just received your Programme for your upcoming performance with the Phil. I listened to a few minutes of “to Notice Such Things” and after the fourth take I realized that your piano is so intricate to the performance, its almost mystical. I’m just delighted to hear about your classical work with the Phil. Of course, Jon, as you know, we also loved your classical works with Ritchie Blackmore and the Tokyo Philharmonic on Deep Purple’s Finyl Vinyl album. And too, Jon Lord, you’ve always been so blessed to give us such “spellbinding” sounds in the cllassics or rock ‘n’n roll. But this new piece dedicated to your friend Mortimer is so pure and refined, its mystical. We look forward to your transatlantic concerts if we can’t make your Luxembourg show! Thanks for writing, Myrrari. Just to let you know that Jon Lord had nothing to do with Rainbow‘s Finyl Vinyl album or their performances of Beethoven’s Ninth. Jon has been a musical inspiration to me for many years. I feel I’ve grown with him on a musical journey that has lasted for decades. I’ll not go into the protracted discography now; we all know it well – but since leaving Purple he has embarked on a new path making the transition to the classical genre with a great deal more success than many. He seems to grow with every new work and ‘To Notice Such Things’ is no exception. It is simply beautiful. I’ve enjoyed the live Purple experience on numerous occasions, but I’ve yet to see Jon Lord in concert. I hope the wait will not be too long.